Do you ever wonder what happens to all the deer and moose that get hit on the highway? There is a boneyard deep in the woods. The deer and moose could show you where. They know the place where the trees stop and the carcasses begin. All the Things We Leave Behind begins with Violet and her brother Bliss stumbling accidentally upon this boneyard when they are young. Violet was initially shaken by it, but it is Bliss who carries it with him. The boneyard was his first proof of unhappy endings. Deer carcasses and moose bones are not the only things ‘left behind’ in this book; there are all the antiques left behind by those who die or move away. This is how Violet’s family makes their living – selling antiques out of an old purple barn on the side of the highway near the St. John River in New Brunswick. “The Purple Barn is the St. John River Valley’s ultimate roadside attraction.” Near the “town that drowned” in Riel Nason’s first book. It’s understandable that an heir would keep something like a piece of jewellery that the former owner wore often, but I think sometimes people are a little too eager with their declarations of sentimental value. Things are things, nothing more, regardless of who owned them, touched them, kept them sitting on a shelf in the background of their life. A cup and saucer owned by your grandmother should be no more important than any other cup and saucer simply because she spent twenty-five cents to buy it on some insignificant trip to Fredericton, and she liked the roses on it better than the green ferns on the only other one in the store that was marked down, and she had just wanted a little something as a pick-me-up since the kids were driving her crazy. A vase of your dead aunt’s that you love she may have hated, and perhaps she kept it only so the neighbour who gave it to her would see it in use. She may be rolling in her grave, thinking of you making it seem as if she had such terrible taste. Other things we leave behind include our youth, our innocence, and ultimately, often, our loved ones. Bliss spent years dreaming about traveling to all the places whose names were on the licence plates of the tourists who came to the Purple Barn. After his grade 12 graduation, he finally managed to slip away. This summer of 1977, Violet’s parents have gone in search of any sign that might lead them closer to Bliss, while Violet stays home to help with the business. Through Violet we meet the other characters in the novel; those who also work at The Purple Barn, the mysterious man living in the cabin next door to Violet’s at the campground, Foster the Hermit, and Violet’s friend Jill. But most of the book’s narrative is concerned with the relationship between Violet and Bliss as they grow up alongside The Purple Barn, and in the shadow of something bigger than both of them. Until the day Bliss disappears, without her. There are so many incidents that can start out small and don’t seem like anything at the time but end up meaning so much. There are so many tiny twists in a life that you can never know the ultimate significance of. The time and place. As in The Town That Drowned, I felt that quality of writing coupled with time and place that had me yearning for the days before smart phones and Facebook. The days where you could wander off alone and actually be alone; people had to physically look for you to find you. I love the image of Violet taking her breaks from work by the stream where she kept a lawn chair and a few cans of pop under the water to keep them cold, and the image of the chain of pop can tabs encircling the ceiling of the campground office from all the cans that had been bought and opened there. The Hermit. Foster sold the family his barn, then moved up into the woods to live alone and off-the-grid. The first time we meet him, he’s sitting in the sun in a homemade twig chair reading The Blue Castle by L.M. Montgomery. While Violet is left in charge of the family business, she’s called upon to come and have a look at the contents of the old Vaughn estate; a place that has stood empty of humans for years and has aroused people’s curiosity. Nason describes the way it was left by the former owners, and it made me ache to see it for myself. 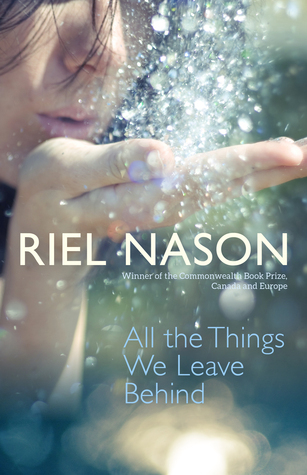 Anyone looking for a quiet, gentle small-town story that may have you yearning for times gone by (even if you weren’t born until after those times had already gone by) can’t go wrong with either one of Riel Nason’s books. And both have a whiff of the mystical; just enough to have you believing. Thank you to Goose Lane Editions for sending me a copy of this book for review! Riel Nason is also a Textile artist. Have a look at her book Modern Selvage Quilting (2016). I explained over on Marcie’s blog today why I haven’t read Nason’s first book. I’m rectifying that as soon as I type this – that is, I’m putting it on hold at the library. Somehow I feel I should read these in the order they were written, and I’m very anxious to get to this new one! You’ll like them both, I’m sure! Both of these sound very appealing. I like nostalgic books. I’ve noticed some novels recently that are deliberately set just that little bit in the past, maybe in 2004 or 2008, so that the Internet and phones aren’t quite so overwhelming a reality. I doubt this author’s work is available in the UK, but I’ll look into it! Thanks for another appealing review. I had never before given any thought to what happened to large roadkill. But, obviously, it can’t be left on the side of the road like a mouse can. Oooh… maybe her next book could be about the Hermit – that would be fun! I also love his part in the book. ‘There are so many tiny twists in a life that you can never know the ultimate significance of’ This quote alone would make me read this book, but your great review makes me want to read it even more. Sounds like there is real depth to this one. Isn’t that a great quote? I could drive myself crazy thinking of all the tiny things that have happened, or tiny decisions I and others have made that have turned out to be significant. In a way, it’s obvious -but not something that we necessarily think about. This one sounds very unusual. There is a bit of mysticism in it, but only a touch.Otherwise, it’s just a good story – not *too* unusual. Is it a YA book? Wondering if my daughter (13) would like to read it? It’s not YA, but there’s no reason why teens couldn’t read it. I’m thinking she might like her first book better – I found it a little more straight forward. Could be! I haven’t read enough of his books to be able to say for sure, though. And it’s been a few years since I read one. Something I should fix! But, definitely not as depressing! Lovely review. This sounds like a really good read. Like the BBs have said, I love the way you described the mysticism in the story. It’s as though the author found a way to make all of this reside in the character(s) themselves, so that even if we aren’t the kind of people who would naturally think/see this way, it’s still believable in their experiences and in their voices. It’s such a delicate construction, but it works very well! I think it would be cool to discuss with the author why she decided to go with The Blue Castle, and if there were any other contenders. Love it! And, yes, you’ve said it perfectly – I’m not usually big on mysticism, but she handled it well, and made it convincing. I think I need to add this one to my to-read pile. 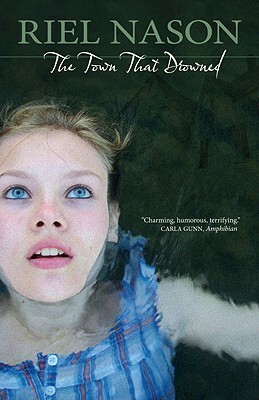 Do you need to read the drowned town book first? I’m really interested in the part you quoted about things not meaning what we want them to mean. I think about this a lot; I used to keep everything for fear of forgetting or hurting someone’s feelings, but then my great-grandma died and left all of her stuff behind. In the months before her death when she was sick, she had been moved to my grandmother’s house–WITHOUT most of her stuff–and STILL it took forever for my grandma to go through all of her things in that single bedroom. Who knows what matters and doesn’t especially if a person keeps a lot of papers, notebooks, and cards. You definitely don’t have to read The Town that Drowned first – it’s just neat to “get” the references made to it. But it’s a completely different story, so it’s fine to read it on its own. I really loved all the antiques in the book, and that passage spoke to me, as well (obviously). It made me think twice about some of the stuff I hold on to, and why I’m holding onto it. I checked my library and there are no books by that author here. However, there is a book I own by Dawn Raffel about objects that was an Oprah book pick. Okay thanks the word on this author. I had not heard of her before. I will keep an eye out for them.